We take seriously the commission of Christ to make disciples and to teach them to follow Him (Matthew 28:18-20). To that end, Calvary Baptist Church members willingly offer their prayers, time, abilities, and possessions. We, as a church family, are affiliated with the Southern Baptist Convention of Texas and adhere to the Baptist Faith and Message 2000. 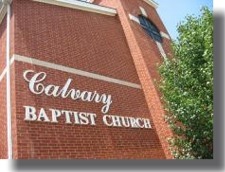 In keeping with our Southern Baptist beliefs, Calvary is an autonomous local congregation. We choose to cooperate in missions and benevolence by giving a percentage of gifts offered by our members through the Southern Baptist Convention Cooperative Program. In addition, we receive annual offerings to support state, home, and foreign missions. By professing faith in Jesus Christ and following Him in believers baptism. By transferring your "church letter" from another Baptist Church. By statement of your faith in Jesus Christ and that you have been baptized by immersion following salvation. By statement of your faith in Jesus Christ from another denomination that does not practice believer's baptism. This is a statement of faith in Jesus Christ and a willingness to be baptized. We believe in the Bible just as it is for people right where they are. Our mission encourages non-Christians to become Christians and Christians to become more like Christ. We do this through a balance of Evangelism. Discipleship, Fellowship, Worship and Service.